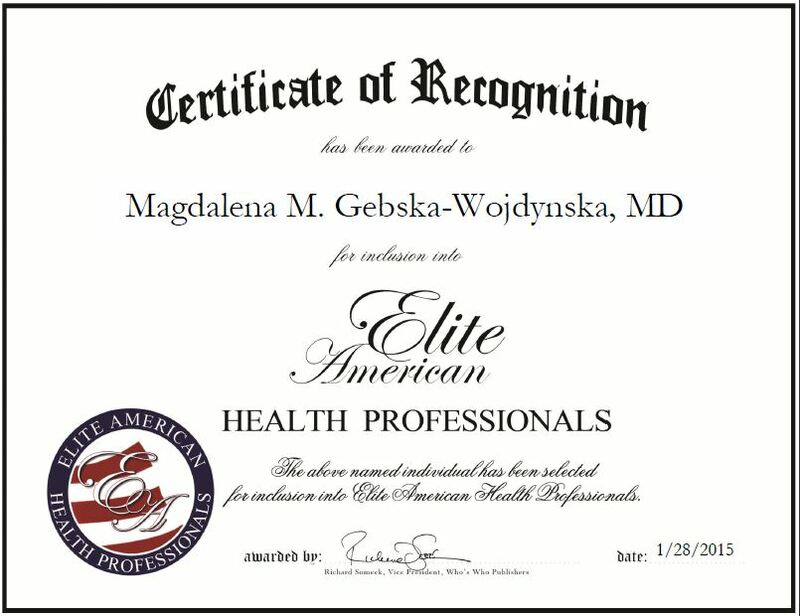 Dr. Magdalena M. Gebska-Wojdynska is a well-established medical professional who has been practicing medicine for the past 21 years. She began her journey in the field in Poland where she finished medical school and started her residency in internal medicine and endocrinology. But, due to political turmoil, she left the country. After that, Dr. Gebska-Wojdynska had the opportunity to choose another residency. With a foundation and experience in internal medicine and endocrinology, she decided to pursue psychiatry. Dr. Gebska-Wojdynska’s background and interest in women’s health, with emphasis in executive and cognitive function, has enabled her to treat a variety of patients. She mostly works with adults who have ADD, ADHD and hormonal imbalance, as well as people suffering from depression and anxiety disorders. Dr. Gebska-Wojdynska works with other health care professionals in order to provide her clients with the best possible treatment options that will deliver results. She looks to guide her patients through their self-discovery to achieve optimal results. She infuses various healing paths to meet her clients, social, spiritual and biological needs. The winner of the Patients’ Choice award in 2011, Dr. Gebska-Wojdynska looks to continue the practice and stay on top of what’s new. She is very interested in integrative medicine, both traditional and nontraditional, and plans to help as many people possible with a holistic approach. This entry was posted in Doctor and tagged ADD, ADHD and hormonal imbalance, holistic medicine, internal medicine and endocrinology, Psychiatry, self-discovery, women's health. Bookmark the permalink.